Overview: The flavor of Imperial Rome is now available in a video slot of truly epic proportions. Featuring 50 pay-lines as the arena where Wild symbols, up to a hundred Free Spins and Scatter chances aplenty await the player.The central figure in this absorbing game is the heroic Gladiator himself, with the armour and weapons that have made him so successful. When the Gladiator and his Roman Maiden combine, it creates a Mixed Pay reward. 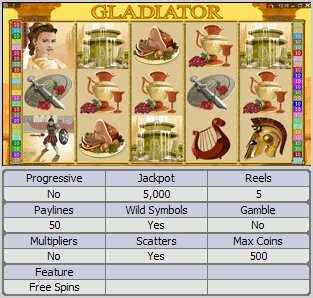 Other desirable symbols in Gladiator are the Gold Coin that helps players build winning combinations as the Wild, and the Imperial Roman Eagle which acts as the Scatter - 3, 4 or 5 of these can present the player with the unprecedented advantage of a triumphant 100 Free Spins. For the growing legions of gamblers who enjoy action play amid the ambience of Ancient Rome. Similar Slots: If you like Gladiator, you might like these other 5-reel slot machines: Age of Discovery, Bob's Bowling Bonanza, Franken Cash, Get Rocked!, Monster Mania, Winter Gold.